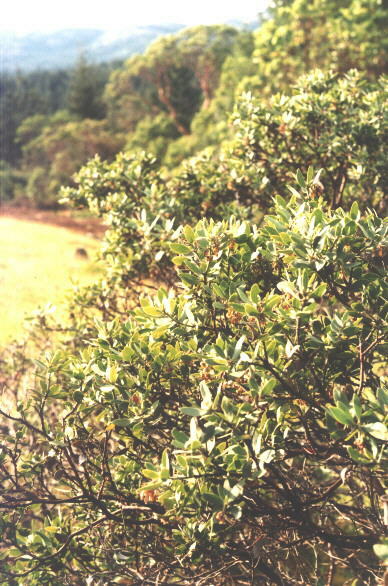 Hairy manzanita is found along the Coast Ranges from Sonoma County, California, north to Vancouver Island and Vancouver, British Columbia. The largest population is in southwestern Oregon. It prefers evergreen forested coastal plains from northern California through British Columbia (1). This plant is occasionally found on the western slopes of the Cascade Mountains in Washington and Oregon (1). Hairy mazanita grows at elevations up to 2,500 feet in California, 3,750 feet in Oregon and up to 4,950 feet in Washington (1). Hairy manzanita is typically found in rocky areas and steep slopes. It prefers full sun, well-drained, acidic soil, and a southern or western exposure. It is highly drought tolerant (1,3). Often a primary or secondary colonizer of disturbed plant communities, hairy manzanita is commonly found in post-logging plant communities. Once established in such a situation, it will persist after forest establishment if the canopy is not too dense (1). Hairy manzanita is often found with other ericaceous plants such as huckleberry, salal and Pacific madrone. Other common species include Oregon grape (Mahonia spp. ), snowbrush (Ceanothus spp. ), vine maple (Acer circinatum), beargrass (Xerophyllum tenax), various penstemon species, Oregon stonecrop (Sedum oregonese), and various fern species (1). Hairy manzanita may be propagated by seed, cuttings, layering, or salvaging. The fruit is small, 1/4 - 1/2 inches in diameter, and is smooth and red. It begins to ripen in late June and may stay on the plant until the following spring (1). Cuttings are best collected in March, September, October, or November (2). Hairy manzanita requires fire to break seed dormancy and maximize germination. This can be simulated with a hot water bath. The procedure for a hot water bath is as follows: Boil 3-6 cups of water for every cup of seeds. Avoid using an aluminum pan or softened water, as either might introduce toxic chemicals to the seeds. After the water reaches boiling, let it cool for a minute or two. Pour the seeds into the water and let them sit at room temperature for 24 hours. The seeds may still need to over-winter or be cold-stratified before they will germinate (5). Other suggested methods include soaking dried seed in boiling water for 10 - 20 seconds or exposing to smoke and then stratifying at 2 - 5°c for 2 months. The seeds will germinate in 2 - 3 months at 15°c (4). Information on seed life is not available. Information on seed storage conditions is not available. Recommended propagation is through basal cuttings (from the area close to the previous year’s wood, or the base of a long juvenile stem). The cuttings should be dipped in a rooting hormone. Stimroot #3 IBA is recommended. They can then be rooted in 1:1 perlite/peat moss media with bottom heat (2). Cuttings should be propagated in a perlite/peat mixture (see above). Installation of plugs or containerized individuals is recommended. Shrubs should be installed 3-5 feet on center, depending on desired density and expected mortality (3). While hairy manzanita is highly drought resistant, supplemental water after installation increases plant survival and establishment. Hairy manzanita grows quickly and can reach several feet in height (1). (1) Hansen, W. Native Plants of the Northwest: Hairy manzanita (Arctostaphylos columbiana). http://www.nwplants.com. Retrieved May 14, 2003. (2) Malaspina University-College Horticulture Department. Abstract on Native Plant Propagation Collaborative Study. http://www.mala.ca/horticulture/abstract.htm. Retrieved May 14, 2003. (3) Plants for a Future. Arctostaphylos columbiana. http://gardenbed.com/A/448.cfm. Retrieved May 14, 2003. (4) Sound Native Plants. http://www.soundnativeplants.com. Retrieved May 14, 2003. (5) Washington State University Cooperative Extension. Gardening in Western Washington. http://gardening.wsu.edu/text/nvgrowng.htm. Retrieved May 14, 2003.